I found these beans back in January while wandering around the big market in Cuernavaca Mexico. Like almost all markets in Latin America, there’s so much to look at it was a little hard to take it all in. At one vendor’s stall I looked down and there, among the usual plastic woven bags filled to the brim with posole, beans, and chiles were these gorgeous, fat, purple beans. I had never seen them before. I stopped and stared, waiting for the vendor to finish helping another customer. Interestingly, a solo male shopper somehow picked up on my excitement and in very slow, elementary Spanish patiently told me what they were called—Ayocote Beans. He then spelled the name for me slowly so I could write it in my notebook, and told me that these types of beans are commonly eaten with molé in the state of Morelos. I’ve cooked with Steve Sando’s Ayacotes, before but I’ve never seen the purple version. Throughout this exchange, the vendor just watched us, smiling. I thanked the man profusely and marveled on what had just happened. In Mexico, the women in the household usually do the marketing and the cooking. Sometimes you’ll see entire families shopping together, but it is rare to see a man shopping for food alone, especially one so clearly passionate that he was willing to share his knowledge with an ignorant gringa. (Incidentally, some of the people I met in Cuernavaca call this place north of the border “Gringolandia”, but not unkindly) He was either a chef or a renaissance man. I hung onto these for a couple months until it was time to make a celebratory bean dish. I wanted to do them justice, but didn’t want to make molé. Plus I needed something vegetarian so I went on over to Heidi Swanson’s bean-friendly vegetarian blog, 101 Cookbooks, and found this recipe which I improvised from to create my own. Basically I kept the queso and pesto, ditched the breadcrumbs, added nopales, and switched out the tomato sauce for a straight chile sauce. You don’t have to smuggle exotic beans from Mexico. 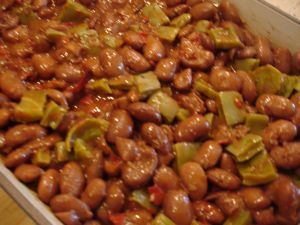 I think either recipe would be great with pretty much any bean—from pintos to cannellinis, to borlottis. Destem and remove the seeds from the chiles. Toast the chiles in a hot dry cast iron pan or comal until fragrant but not smoking, about 20 seconds per side. Remove them to a small bowl and pour boiling water over. Soak for 20 minutes. Put the chiles, the 3 garlic cloves, the oregano, and a few pinches of salt in a food processor or blender, reserving the chile soaking water. Process until smooth, adding chile soaking water a little at a time until the puree is the consistency like that of thin batter. Using the edge of a sharp knife, scrape the spines off the nopales. Slice them into thin strips and then dice them. Boil for 10 minutes in salted water until tender. Drain. 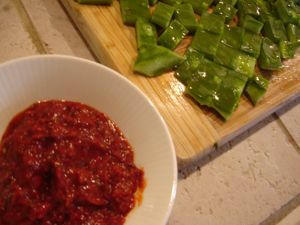 Preheat the oven to 350 degrees and, in a large casserole dish, stir together the beans, the chile puree and the nopales. Sprinkle with queso fresco and then bake until brown and bubbly. Meanwhile, make the pesto. Place the cilantro leaves and garlic in the bowl of a food processor. Process until finely chopped. Add the lemon juice and salt and then slowly add the olive oil in a thin stream until the mixture is smooth and emulsified. 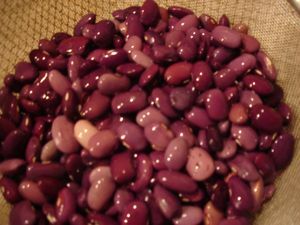 Drizzle over each individual serving of beans. This entry was posted in Food and Drink, Latin American, entertaining, from the market, healthy, hearty. Bookmark the permalink. Post a comment or leave a trackback: Trackback URL.